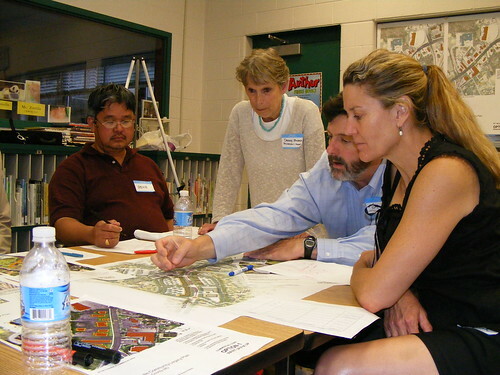 Burtonsville residents and county planners at a community charrette in 2008. Tonight, county planners are hosting a charrette, or community design workshop, about the future of Burtonsville. It'll be at 7pm at the East County Regional Service Center, located at 3300 Briggs Chaney Road. As you may know, the Planning Department is developing a plan for the Burtonsville Commercial Crossroads, defined as the area around the intersection of Route 29 and Route 198. 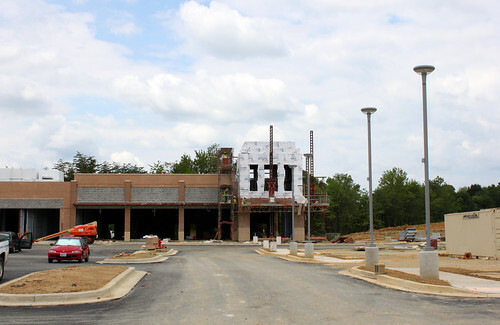 Businesses in the neighborhood have been struggling since the Burtonsville Bypass opened in 2006, while the new Burtonsville Town Square shopping center has brought new life resulted in a game of musical chairs as stores formerly located across the street move in. Plans Around Town - Burtonsville - MP 27 from M-NCPPC on Vimeo. At the now largely-abandoned Burtonsville Crossing shopping center, he tries to talk up the remaining stores. "You've got assets here," he says. "You've got a Hair Cuttery. Everybody needs their hair cut. And two beer and wine stores, a little more than normal." Driving (not walking) down Route 198 (did he at least have a coffee at Soretti's? ), he laments, "For the most part, what you see will be here a long time." 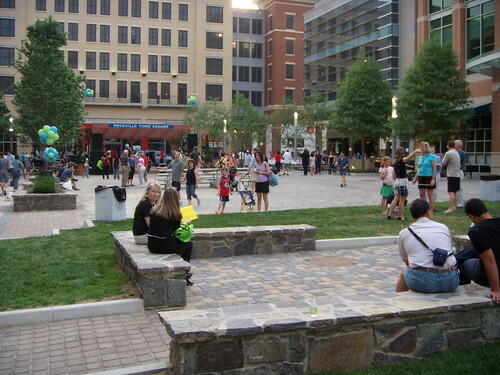 Rockville Town Square in 2007. It looks like Burtonsville residents are beginning to see the difference. Results from a meeting planners had with the East County Citizens Advisory Board last month (PDF!) seem promising. In that meeting, members of the board - which is composed of seventeen East County residents appointed by the County Council - suggest a number of improvements to Burtonsville. They include better landscaping along Route 198, creating a "mixed use zone" that would allow housing and offices in addition to existing shops, having "more entertainment venues" in the area, and improving pedestrian and transit access. That sounds like a place people might actually want to visit, which is more than you can say about Burtonsville now. Going to graduate school three hours away will keep me from attending (is social media an appropriate substitute for participating in person? ), but I hope those who support a better Burtonsville and not just the status quo will come out and say their piece. Unlike the 2008 charrette, which was focused on minor improvements, the Planning Department appears to be interested in more substantial changes. Don't screw this up, y'all. If East County wants nice things like Rockville and Bethesda, it has to know what to ask for and how to ask for them. Now's your chance. Burtonsville needs a movie theatre. I think the old Giant site, Heck the entire old Burtonsville Crossing Shopping Center should be torn down for a bowling alley and multiplex movie theatre. I live in Laurel and there is no decent movie theatre nearby, I don't particularly like the Beltsville theatre and Columbia is a bit of a journey. As far as Burtonsville needing to be more Rockvillish or Bethesdafied, I disagree. Burtonsville is a unique locale, it has always prided itself in being close to the city yet "away from it all." We don't want it to lose its identity. After all, Maple Lawn is just a couple miles up 29 and that is where all of the fancy pants restaurants and retail opportunities are being met, seems redundant to expect that for Burtonsville. We are in a tough place economically which is why Konterra in Laurel was cancelled. We don't need any more retail worlds. We just need some decent stores in Burtonsville that cater to the actual demographic, which in my opinion is older and more sophisticated people as well as families. There is no need to FALL INTO THE GAP when it comes to Burtonsville, we can do that at Columbia Mall. Keep it green and keep it simple when it comes to this town. I was referring to the town square in the picture, not the fancy shops around it, though I generally agree with what you said. I attended the meeting last night and thought it went very well. Business owners and residents were in agreement that changes need to occur, everything from improvements to fix traffic congestion, facade changes, gathering places, and interconnectedness between centers. Most agreed that losing the Amish market was a blow to our town and that we need a draw to attract people again. People mentioned mixed-use building and how to attract drivers from the new 29. Burtonsville has a lot to offer and it was nice seeing so many community members come together to talk about a unified vision.